This is the second call for attendees for our upcoming introductory training course for those who wish to learn how to use GIS in biological research, and it will provide an introduction to using GIS in a wide variety of biological research situations ranging from the basics of making maps through to studying the spread of diseases and creating maps of species biodiversity. It will consist of a series of background sessions on using GIS mixed in with practical sessions where you will work directly with GIS software to complete various tasks which biological researchers commonly need to be able to do. The course will be held in Glasgow, Scotland, on the 18th and 19th of March 2019 and it will be taught by Dr Colin D. MacLeod, who has more than 15 years experience in using GIS for a wide variety of biological purposes. For those who cannot attend this course in person, a shorter online course based on the same materials is available from our sister site www.GISforBiologists.com. The course will primarily be based around QGIS (also known as Quantum GIS), which provides a user-friendly, open-source, free alternative to commercial GIS software packages, and it is becoming increasingly widely used in both academic and commercial organisations As a result, it is aimed at both those with no GIS experience, but wish to learn how to do GIS with QGIS, and also those who are familiar with using commercial GIS software, such as ArcGIS, but who wish to learn how to use QGIS as an alternative. However, this course is taught using software-independent approach, and it is also open to those who wish to learn how to use ArcGIS to do biological GIS. 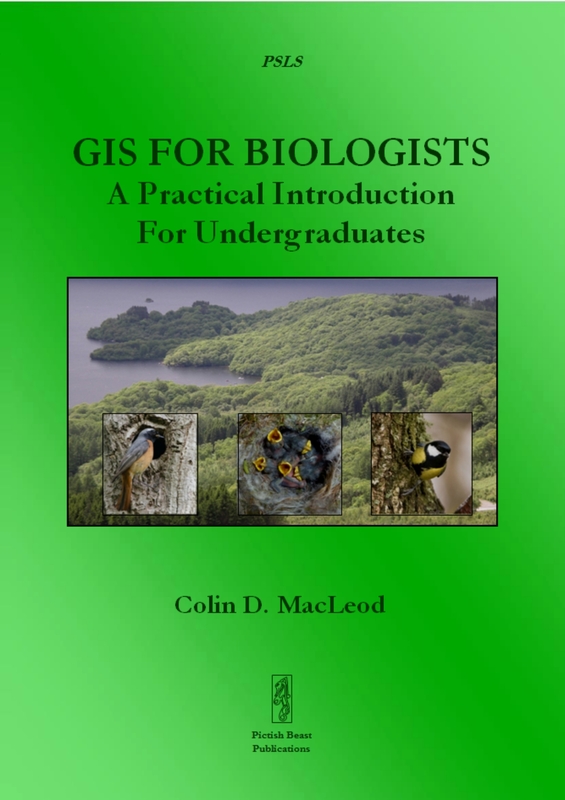 The practical exercises on this course will be based on those in the recently published GIS For Biologists: A Practical Introduction For Undergraduates by Dr MacLeod, and a free copy of this book will be provided to all participants. Attendance will be limited to a maximum of 16 people, and the course will cost £295 per person (£200 for students, the unwaged and those working for registered charities). To book a place, or for more information, visit http://gisinecology.com/an-introduction-to-using-gis-in-biological-research/ or email info@GISinEcology.com. Glasgow has great transport links and is within half a days travel by car or by fast train links from most cities in the UK. For example, it can be reached in as little as 4h 30mins from London by train. It can also be reached by direct flights from many European cities and the flight time is generally under four hours. The exact venue for the course will be confirmed closer to the time of the course, but it will be held in Glasgow city centre. Attendees will be responsible for their own accommodation. However, Glasgow provides a wide range of accommodation options to fit most budgets. GIS In Ecology will be holding an introductory training course for those who wish to learn how to use GIS in biological research, and it will provide an introduction to using GIS in a wide variety of biological research situations ranging from the basics of making maps through to studying the spread of diseases and creating maps of species biodiversity. It will consist of a series of background sessions on using GIS mixed in with practical sessions where you will work directly with GIS software to complete various tasks which biological researchers commonly need to be able to do. The course will be held in Glasgow, Scotland, on the 1st and 2nd of October 2018, and it will be taught by Dr Colin D. MacLeod, who has more than 15 years experience in using GIS for a wide variety of biological purposes. For those who cannot attend this course in person, a shorter online course based on the same materials is available at GISforBiologists.com. The course will be held in central Glasgow at the IET Glasgow Teacher Building (14 St Enoch Square, Glasgow, G1 4DB, UK). Attendance will be limited to a maximum of 16 people, and the course will cost £295 per person (£200 for students, the unwaged and those working for registered charities). To book a place, or for more information, email info@GISinEcology.com. The course will be held in Glasgow, Scotland, on the 9th and 10th of April 2018, and it will be taught by Dr Colin D. MacLeod, who has more than 15 years experience in using GIS for a wide variety of biological purposes. For those who cannot attend this course in person, a shorter online course based on the same materials is available at GISforBiologists.com. Attendance will be limited to a maximum of 15 people, and the course will cost £295 per person (£200 for students, the unwaged and those working for registered charities). To book a place, or for more information, email info@GISinEcology.com. This is the final call for our upcoming introductory training course for those who wish to learn how to use GIS in biological research, and it will provide an introduction to using GIS in a wide variety of biological research situations ranging from the basics of making maps through to studying the spread of diseases and creating maps of species biodiversity. It will consist of a series of background sessions on using GIS mixed in with practical sessions where you will work directly with GIS software to complete various tasks which biological researchers commonly need to be able to do. The course will be held in Glasgow, Scotland, on the 25th and 26th of September 2017, and it will be taught by Dr Colin D. MacLeod, who has more than 15 years experience in using GIS for a wide variety of biological purposes. For those who cannot attend this course in person, a shorter online course based on the same materials is available at GISforBiologists.com. To purchase in the US, click here. To purchase in the UK, click here. For all other countries, visit your local Amazon website. To sign up to the GIS In Ecology announcements mailing list, simply click here.